I am not sure how to begin this post today. I am joining the biggest blog hop in history ( I think!) to say a huge THANKS to the ever so Moxie Fab Cath Edvalson!! It is for sure with mixed feelings that I see Cath leaving Paper Crafts Magazine - and I want to thank Cath from the bottom of my heart for bringing years of inspiration to crafters and cardmakers, for writing great product reviews, for spotting trends, for bringing all the moxie fabulousness to our attention, each day on the wonderful Moxie Fab World blog. This is my card for you, Cath! You just totally rock, girl! I wish you all the best in your new adventures to come! - to indicate the 5 years of Moxie Fab blogging with loads of inspiration! I you have time today - go back in history to check out the very first post on the Moxie Fab World blog and read about the story behind Moxie Fab! Now, the next on the list is the very talented and sweet Nina Bracket from Croatia ! She will for sure have something awesome up her sleeve ! My dear friends, I hope you'll have fun hopping today. WOW - isn't this just MOXIE amazing! ?? No one deserves this more than YOU, Cath! So pretty! Love that brad & sequins! Amazing card, Pia! Love that you added the "5" with modelling paste! 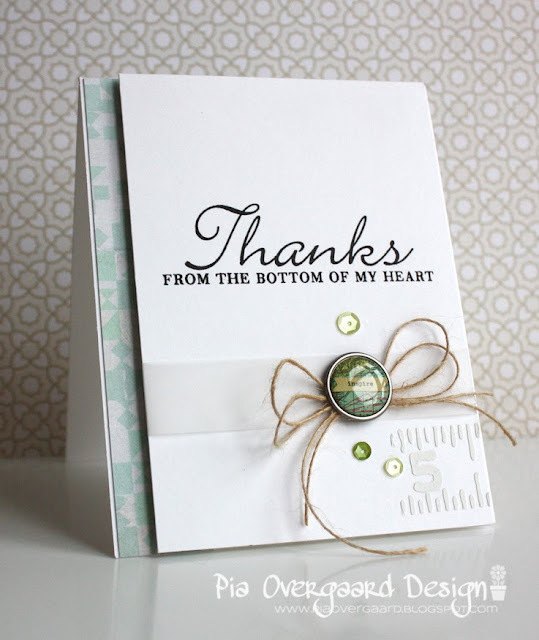 Pia, fabulous card and such a lovely post! 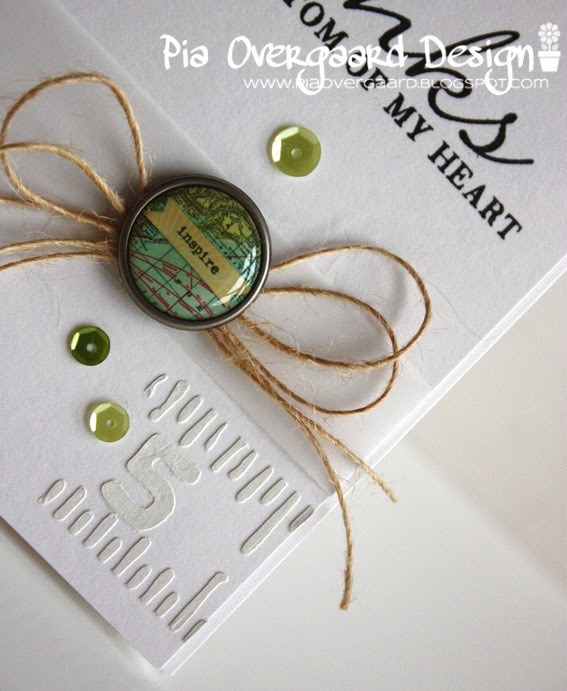 I love your design and colours and the creative way you incorporated Cath's five Moxie Fab years into your card! Oh wow Pia - love it! Pia, your card is beautiful! I love the special details you added! Love your card Pia! So many trendy details in a CAS style! Pia, this is amazing! Absolutely awesome card! Pretty card! Fun hop to honor Cath! Skønt kort - og vildt kreativt tænkt med 5-tallet. Smukt. Such a pretty card, Pia! LOVE the details! Stunning card! I just love the whole thing! Stunning card! The modeling paste ruler is such a fun, subtle accent. I love, love, love this card, Pia!! This is beautiful! I love the string and the brad!